A science classroom is an exciting place, full of fun experiments and interesting lessons; however, it also poses some unique dangers for students. From chemical compounds to electrical currents, science is all about hands-on learning. Following posted rules and keeping important guidelines in mind can help everyone stay safe and have fun during science class. At the begriming of the school year, it's always a good idea to post and go over important rules for science safety. No matter what age they are, kids can get overwhelmed by all the excitement of conducting experiments and learning new ideas, and they sometimes forget to follow basic safety rules. Print out a list of science class rules and post them in the classroom or distribute them to students to review. You can use these printable rules or make up your own version. Print these free science classroom rules! No roughhousing, pushing, running, or other horseplay during class or lab. It's too easy for accidents to happen. Work quietly, and be courteous to others and respectful of their space. Distractions can lead to accidents. Don't eat, drink, or chew gum during class. You could accidentally ingest chemicals and other harmful substances. Always wear your safety gear. This may include goggles, lab aprons, gloves, and more. Let the teacher know if something spills or breaks. That way, you can make sure it's cleaned up properly. Know where all the classroom exits are located, as well as safety equipment like eyewash stands. Read all the instructions carefully. In lab, read instructions twice before you begin working. Never touch anything in the lab until your teacher gives you instructions to do so. Notable science classroom accidents, such as a sudden fire that severely burned four middle school students in Maple Grove, Minnesota in 2011, are rare, but they do occur. Minor injuries are more common, but there isn't an official count of these events. Parents, teachers and school administrators need to be aware of the precautions that have to be in place when experiments or demonstrations are in progress or in areas where chemicals are stored. 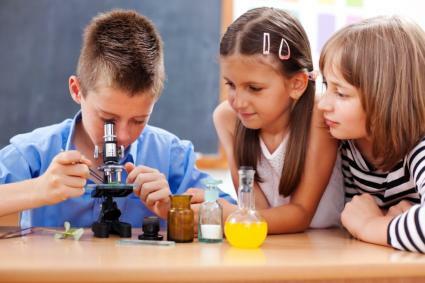 There are a number of ways that teachers and other school personnel can ensure the safety of students in science class. When there are a large number of students in a small classroom, there is a much higher risk of an accident occurring as experiments are carried out in close quarters. In crowded classrooms, high school and middle school students are more likely to bump into one another while working with chemicals, causing spills that are potentially harmful. Additionally, the student-to-teacher ratio in an overcrowded classroom may make it difficult for a teacher to adequately monitor students' work and answer questions that arise. Whether kids are working with harmful chemicals or simply peering at slides under microscopes, they may need more than a sheet of printed instructions and some verbal explanation. Many children are visual learners and require a demonstration of the experiment in order to fully understand what they need to do and how to stay safe. It's always a good idea to show kids what they'll be doing before turning them loose to try it on their own. Because science classrooms are more hazardous than other areas of the school, it's essential to have the necessary safety equipment nearby. This should include plenty of sinks for flushing skin, a shower for washing the entire body in an accident, an eye wash stand for flushing the eyes, fume hoods to remove dangerous vapors, a fire blanket and fire extinguishers for smothering flames, and other personal safety equipment like goggles and gloves. The lab is the most dangerous part of any science classroom, so it's essential that you educate students about staying safe in this area of the class. Read up on School Lab Safety Tips to help. No matter how well prepared you are, accidents do happen. Knowing how to handle them can dramatically reduce the chance of severe injuries. Have a plan in place for how school personnel should handle a science classroom accident, and educate students about their role in helping out. 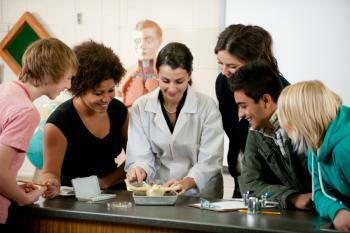 As long as students are safe, science class can be one of the most exciting and educational parts of the school day. Posting classroom rules and following safety guidelines will help avoid accidents and ensure a positive and safe learning experience.